The name "butterwort" may sound quite silly to most but those who have seen one in person can attest to the fact that there is nothing silly about the group of plants this name has been given to. Hailing from the genus Pinguicula, my favorite butterwort is Pinguicula vulgaris. Referred to as the common butterwort, this species is sometimes hard to find if you live in North America. It has a circumboreal distribution and seems to be much more common in Europe and parts of Russia. Like all butterworts, P. vulgaris is a carnivore, though at first glance this may not be very obvious. The fleshy rosette of leaves are covered in mucilaginous glands that trap hapless insects. The leaves will sometimes roll in along the edge to pool the digestive juices around their prey. Unlike more familiar carnivorous plants that can be found in acidic soils, P. vulgaris is a calciphile. It is most often encountered in fens, alvars, and other areas with limestone bedrock and alkaline waters. These types of habitats pose a different set of challenges for plants when it comes to obtaining nutrients. Phosphorus becomes bound to sediments in these alkaline conditions and research has shown that most butterworts respond best to supplemental phosphorus additions, though other nutrients like nitrogen are absorbed from prey as well. If their carnivorous habits weren't interesting enough, the flowers of P. vulgaris (and all butterworts for that matter) are gorgeous. Sitting atop long stalks, the spurred blooms are a deep shade of violet. The nectar spur suggests that this species is pollinated by either long tongued bees or butterflies. Either way, they are presented well above the sticky leaves to reduce the chances of the plant eating the insects it needs for pollination. Like all plants in the northern hemisphere, P. vulgaris needs to deal with winter. As temperatures and light levels begin to drop, P. vulgaris reverts to a cluster of buds called a hibernaculum. It has no roots and can easily blow around if exposed. This may serve to transport plants into new locations. Due to rampant habitat destruction, this plant is quite vulnerable in North America and threatened or endangered in many parts of its range. In a small corner of western Australia grows one of the most unique carnivorous plants in the world. Commonly referred to as the Albany pitcher plant, Cephalotus follicularis is, evolutionarily speaking, distinct among the pitcher plants. It is entirely unrelated to both the Sarraceniaceae and the Nepenthaceae. This stunning case of convergent evolution stems from similar ecological limitations. Cephalotus grows in nutrient poor areas and thus must supplement itself with insect prey. It does so by growing modified leaves that are shaped into pitchers. The lid of each pitcher serves two purposes. It keeps rain from diluting the digestive enzymes within and it also confuses insects. A close inspection of the lid will reveal that it is full of clear spots. These spots function as windows, allowing light to penetrate and confuse insects that have landed on the trap. As they fly upwards into the light, they crash into the lid and, with a little help from physics, fall down into the trap. The relationship of Cephalotus to other plants has been the object of much scrutiny. Though it is unique enough to warrant its own family (Cephalotaceae), its position in the greater scheme of plant taxonomy originally had it placed in Saxifragales. Genetic analysis has since moved it out of there and now places it within the order Oxalidales. What is most intriguing to me is that the closest sister lineage to this peculiar little pitcher plant are a group of trees in the family Brunelliaceae. Evolution can be funny like that. Regardless of its relationship to other plants, Cephalotus follicularis has gained quite a bit of attention over the last few years. Its strange appearance and carnivorous habit have earned it a bit of stardom in the horticultural trade. A single specimen can fetch a hefty price tag. As a result, collecting from wild populations has caused a decline in numbers that are already hurting due to habitat destruction. Luckily they are easy to culture in captivity, which will hopefully take pressure off of them in the wild. What's more, the loss of Cephalotus from the wild is hurting more than just the plant. A species of flightless, ant-mimicking fly requires Cephalotus pitchers to rear its young. They don't seem to mind growing up in the digestive enzymes of the pitchers and to this date, their larvae have been found living nowhere else. If you are lucky enough to grow one of these plants, share the wealth. Captive reared specimens not only take pressure off wild populations, they are also much hardier. Lets keep wild Cephalotus in the wild! I would like to introduce you to quite possibly the strangest members of the Bromeliad family - those of the genus Brocchinia. Aside from the odd appearance and habits of this particular group, researchers have learned quite a bit about the Bromeliad family as a whole from studying this group. From their origins to their impressive radiation, Brocchinia offers us a window into the history of this charismatic family. Brocchinia are considered sister to all other bromeliads. They were the first genus to diverge some 70 million years ago. Their center of origin can be traced back to the Guayana Shield, a region in the northeast corner of what is now South America. 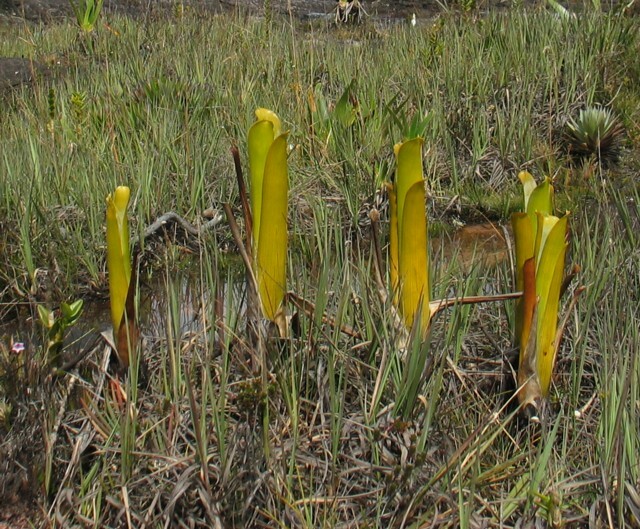 The earliest members of this group were likely terrestrial plants growing in nutrient poor areas. Surprisingly, the epiphytic nature of many bromeliad species we know and love today evolved more recently. Since this time, Brocchinia has undergone an impressive adaptive radiation. Because they have remained specialists on nutrient poor soils, much of this radiation has to do with the evolution of nutrient acquisiton. Like its cousins, Brocchinia utilize a "tank" formed by their tightly clasped leaves. Interestingly, at least two species of Brocchinia, (B. reducta and B. hechtioides) have taken this to the extreme and have adopted a carnivorous lifestyle. Their tall, columnar growth form coupled with slick, waxy leaves means insects can't keep a foothold and fall down into the tank. The plants sweeten the deal by luring them in with sweet secretions. Whether or not this was a case of true carnivory was highly debated until 2005 when a group of researchers analyzed the chemical makeup of the liquid inside the tank. They discovered that they plant was secreting an enzyme called phosphatase, which actively digest hapless insects that fall in. A true carnivore indeed! Others have even more peculiar evolutionary adaptations for nutrient acquisition. B. tatei, for example, was discovered to house nitrogen-fixing cyanobacteria within its tank. Another species, B. acuminata, produces hallow chambers at the base of its leaves that house ant colonies. The ants pay rent via their nutrient-rich waste and voracious defense of their bromeliad home. In total, this group is quite amazing. The amount of information we have been able to glean from studying Brocchinia has allowed us to shine a light on the whole bromeliad family. As we have also seen, the species within this group have quite the evolutionary history to tell in their own way. Brocchinia serves as a reminder to researchers blind to organismal study. We shouldn't have to study ecology at the expense of individual organisms. There is plenty to learn from both avenues of research. There are many downsides to the amount of time some of us spend on the internet but there is no denying that there are some incredible benefits as well. Never before in human history has information been so readily available to so many people. Without Facebook, In Defense of Plants would not have anywhere near the platform from which I can interact with all of you wonderful plant folk. In what may be one of the coolest uses of social media to date, a new species of carnivorous plant has been discovered using Facebook! While exploring a mountain top in Brazil, amateur researcher Reginaldo Vasconcelos snapped a few shots of a large sundew. Upon returning home, the pictures were uploaded to Facebook for the world to see. It didn't take long for scientists to notice that the plant in the picture was something quite special. 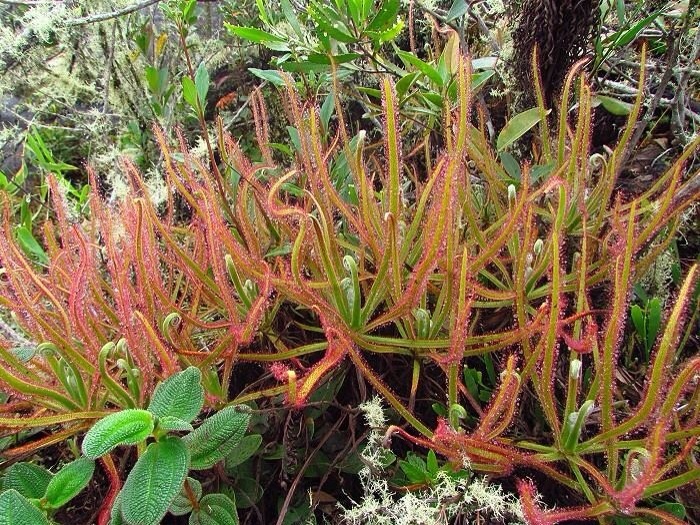 Indeed, what Vasconcelos had photographed was a species of Drosera completely new to science! This is the first time that a new species has been discovered using social media. Experts have now published the first scientific description of this species. It has been named Drosera magnifica - the magnificent sundew. And magnificent it is! According to the authors of the paper, "It is the largest sundew in the Americas, and the second-largest carnivorous plant in the Americas. 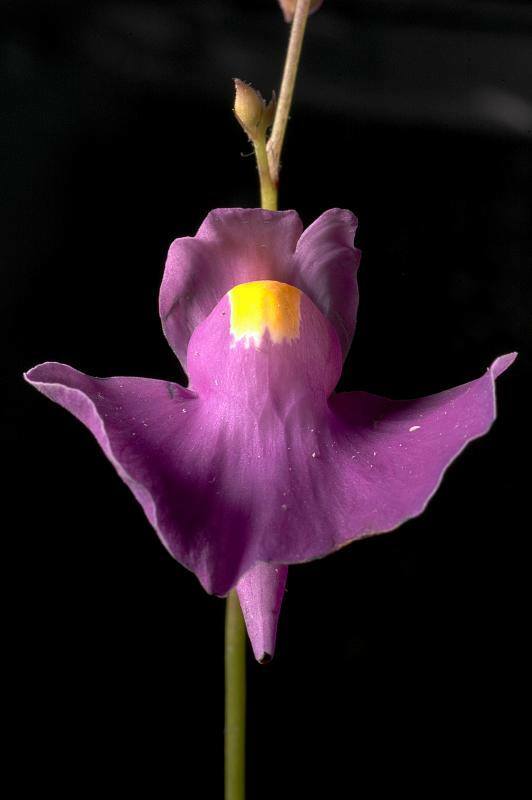 In this respect it is also a spectacular plant.” The plant was discovered in Minas Gerais, Brazil. Oddly enough, the mountain on which it was found is readily accessible. How this species went undiscovered for so long is quite a mystery. It just goes to show you how little we know about the world we live in. That sad part about this discovery is that the mountain it is endemic to is surrounded by cattle ranches as well as coffee and eucalyptus plantations. The future of this brand new species is by no means certain. Researchers have already elevated its status to critically endangered. Unless other populations are found, this species may disappear not long after its discovery. It is so often that common species are overshadowed by something more exotic. Indeed, we know more about some of the rarest plants on earth than we do about species growing in our own back yards. Every once in a while researchers break this pattern and sometimes this yields some amazing results. Nowhere has this been better illustrated in recent years than on the humped bladderwort, Utricularia gibba. This wonderful little carnivore can be found growing in shallow waters all over the world. 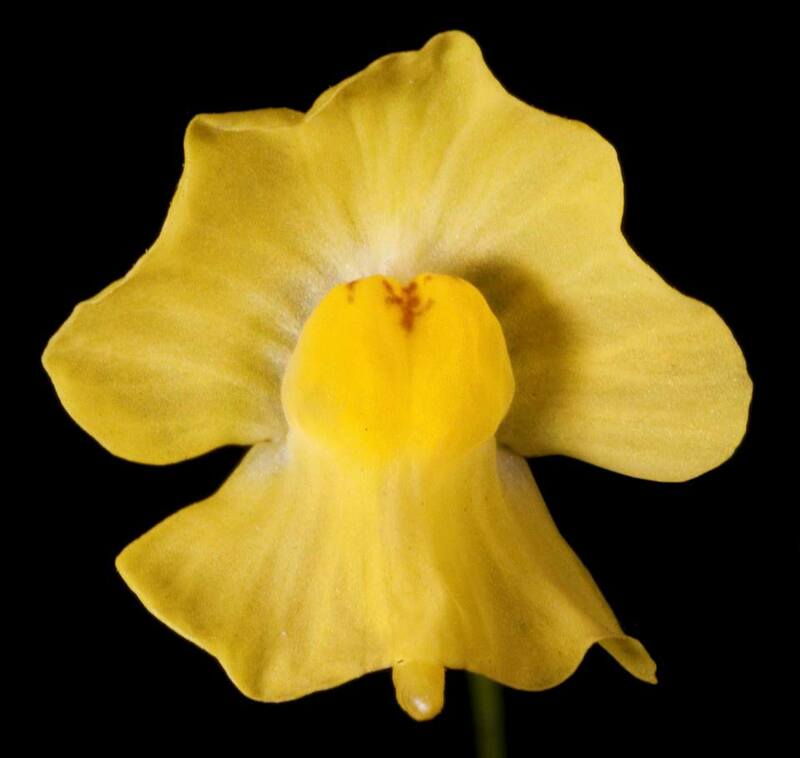 Like all Utricularia, it uses tiny little bladders to capture its even tinier prey. Despite its diminutive size, U. gibba is nonetheless a very derived species. For all of its wonderful physical attributes, the real adventure begins at the microscopic level. As it turns out, U. gibba has some amazing genetic attributes that are shining light on some incredible evolutionary mechanisms. When researchers from the University at Buffalo, Universitat de Barcelona in Spain, and LANGEBIO in Mexico decided to sequence the genome of this plant, what they found was quite startling. For a rather complex little plant, the genome of U. gibba is incredibly small. What the researchers found is that U. gibba appears to be very efficient with its DNA. Let's back up for a moment and consider this fact. The genomes of most multicellular organisms contain both coding and non-coding DNA. For decades researchers have gone back and forth on how important non-coding DNA is. They do not code for any protein sequences but they may play a role in things like transcription and translation. For a long time this non-coding DNA has been referred to as junk DNA. This is where things get interesting. Sequencing of the U. gibba genome revealed that only 3% of its genome consisted of non-coding or junk DNA. For some reason the U. gibba lineage has managed to delete most of it. To put things in perspective, the human genome is comprised of roughly 98% non-coding or junk DNA. Despite its rather small and efficient genome, U. gibba nonetheless has more genes than plants with larger genomes. This may seem confusing but think of it this way, whereas U. gibba has a smaller overall genetic code, it is comprised of more genes that code for things like digestive enzymes (needed for digesting prey) and cell walls (needed to keep water out) than plants with more overall genetic code such as grapes or Arabidopsis. As one author put it, this tiny ubiquitous plant has revealed "a jewel box full of evolutionary treasures." It is a species many of us have encountered time and again at the local fishing hole or in your favorite swimming pond. Time and again we pass by the obvious. We overlook those organisms that are most familiar to us. We do so at the cost of so much knowledge. It would seem that the proverbial "Old Dog" has plenty of tricks to teach us. As it turns out, Marcgravia may not be the only plant out there to have evolved a specialized sonar dish. Growing in the dense tropical forests of Borneo is another completely unrelated plant species that is interacting with bats in some pretty interesting ways. In keeping with this week's trend, I introduce to you Nepenthes hemsleyana (formerly Nepenthes rafflesiana var. elongata). Typical of most Nepenthes, N. hemsleyana produces dimorphic pitchers based on their location on the plant. Pitchers produced closer to the ground in this species are typical of what you would expect form a plant specialized in eating insects. They are scented, slippery, and full of viscous digestive fluids. These stand in stark contrast to pitchers produced further up in the canopy. 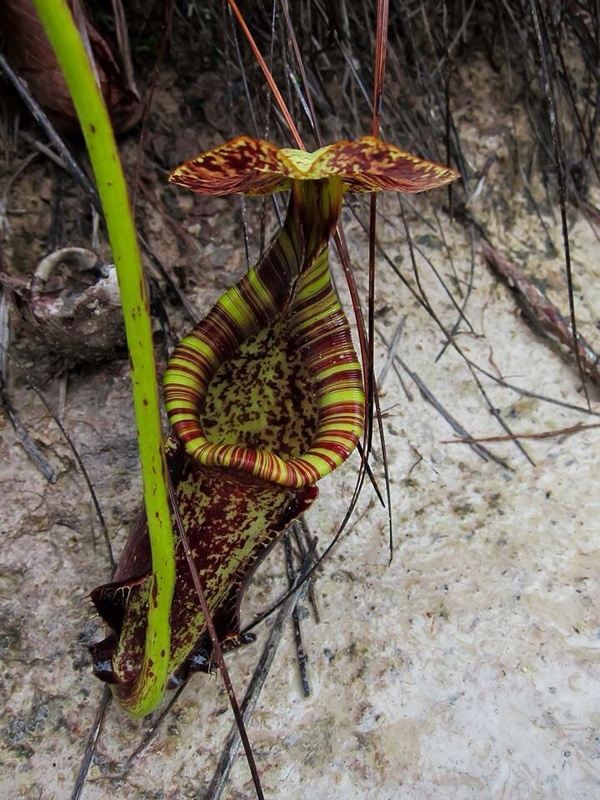 These "high altitude" pitchers are considerably narrower, less scented, contain less digestive fluids, and are 7 times less likely to capture insects. What's more, there is a very obvious parabolic shaped structure in the rear wall of the pitcher. This initially confused researchers for months. Why was the plant producing seemingly useless traps? Then one day they found a bat roosting in one of these odd pitchers. It suddenly all made sense. N. hemsleyana is yet another plant which has formed a mutualistic relationship with bats. The bats in question here are Hardwicke's woolly bats (Kerivoula hardwickii). It would seem that the upper pitchers of this plant provide a wonderful roost, perfect for a couple of bats to fit snuggly within. The narrowness of the pitchers coupled with the low levels of digestive fluids mean the bats are safe from falling in and becoming a meal themselves. As a form of rent, the bats regularly defecate down into the pitcher, providing the plant with a nitrogen-rich meal of predigested bugs. It is estimated that the plant receives upwards of 33% of its nitrogen needs in this way. It was found that the bats were also much more likely to roost in the pitchers of N. hemsleyana than they were in the other endemic pitcher plants in the area, N. bicalcarata. This is due to the frequency of the bats echolocation, which is the highest of any bat species known to science. The researchers feel that this is in response to that parabolic dish produced by the pitchers of N. hemsleyana. Studies show that its has strong echo-reflection for the frequency that they bats are using. It is likely that this helps the bats find the pitchers among the dense vegetation of the Bornean rain forest. Please make sure to visit his website and consider donating to help further bat research and conservation! Pitcher plants in the genus Nepenthes have been getting a lot of attention in the literature as of late. Not only have researchers discovered the use of ultraviolet pigments around the rims of their pitchers, it has also been noted that the pitchers of many species aren't as slippery as we think they are. Indeed, scientists have noted that prey capture is at its highest only when the pitchers are wet. This seems counterintuitive. Why would a plant species that relies on the digestion of insects for most of its nitrogen and phosphorus needs produce insect traps that are only effective at certain times? After all, it takes a lot of energy for these plants to produce pitchers, which give little to nothing back in the way of photosynthesis. The answer to this peculiar conundrum may lie in the types of insects these plants are capturing. Ants are ubiquitous throughout the world. Their gregarious and exploratory nature has provided ample selection pressures for much of the plant kingdom. They are particularly well known for their military-esque raiding parties. It is this behavior that researchers have looked at in order to explain the intermittent effectiveness of Nepenthes pitchers. A recent study that looked at Nepenthes rafflesiana found that ants made up 65% of the prey captured, especially on pitchers produced up in the canopy. What's more, younger pitchers produced closer to the ground were found to be much more slippery (containing more waxy cells) than those produced farther up on the plant. When the pitchers of this species were kept wet, prey capture consisted mostly of individual insects such as flies. However, when allowed to dry between wettings, the researchers found that prey capture, specifically ants, increased dramatically. How is this possible? It all goes back to the way in which ants forage. A colony sends out scouts in all directions. Once a scout finds food, it lays down a pheromone trail that other ants will follow. It is believed that this is the very behavior that Nepenthes are relying on. The traps produce nectar as a lure for their insect prey. As the traps dry up, the nectar becomes concentrated. Ants find this sugary treat irresistible. However, if the pitcher were to be slippery at all times, it is likely that most ant scouts would be killed before they could ever report back to the colony. By reducing the slippery waxes, especially around the rim of the trap, the Nepenthes are giving the ants a chance to "spread the news" about this new food source. Because these plants grow in tropical regions, humidity and precipitation can fluctuate wildly throughout a 24 hour period. If the scouting party returns at a time in which the pitchers are wet then the plant stands to capture far more ants than it did if it had only caught the scout. This is what is referred to as batch capture. The plants may be hedging their bets towards occasional higher nutrient input than constant low input. This is bolstered by the differences between pitchers produced at different points on the plant. Lower pitchers, especially on younger plants are far more waxy and thus are constantly slippery. This allows constant prey capture to fuel rapid growth into the canopy. Upper pitchers on older individuals want to maximize their yields via this batch capture method and therefore produce fewer waxy cells, relying on a humid climate to do the work for them. It is likely that this is a form of tradeoff which benefits different life cycle stages for the plant. There is something about a plant eating an animal that makes it all the more beautiful. Indeed, even without carnivory, the beauty of these highly adapted plant species is up there with the fanciest of horticultural creations. Nowhere is this fact more apparent than in a recently described species of plant from Brazil. Philcoxia minensis has only been known to science since 1981 and the way in which it has adapted to catching its prey is rather incredible. 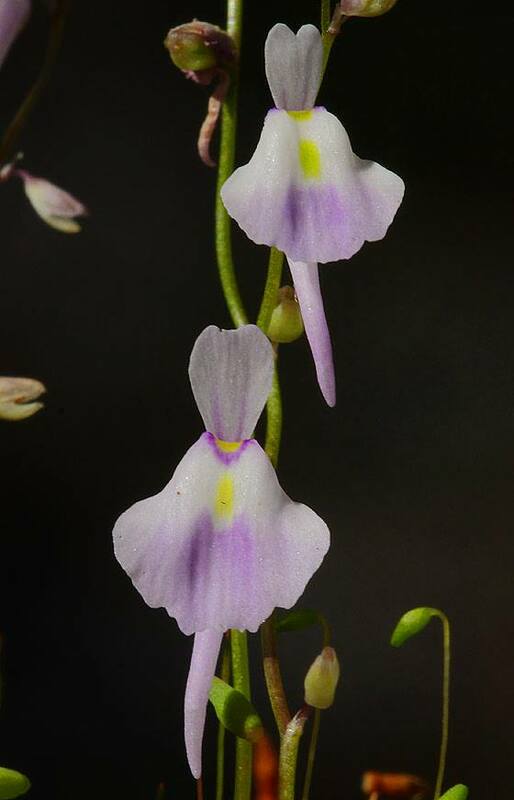 Native to montane savannas of southeastern Brazil, these delicate members of the family Scrophulariaceae grow in nutrient poor, sandy habitats. They seem rather delicate with only a thin flowering stalk readily apparent above the soil line. The botanists who first discovered this species made an interesting observation, the leaves of this plant grow mostly underground. Though they do contain functional chloroplasts, it was initially assumed that they served little function. As it turns out, the leaves can in fact photosynthesize. The white sands that these plants grow in likely permit just enough light to penetrate down into the clear grains, allowing photosynthesis to happen. However, this is not the strangest thing about Philcoxia. Since this genus was first described, botanists have taken interest in the glandular stalks on the leaves. They noted that they were quite sticky and hypothesized that Philcoxia minensis may be carnivorous. Initial investigations into this were not conclusive. Recently, however, this has changed. A study published in 2012 used special nitrogen markers to look deeper into the potential carnivorous habits of this plant. What they found was quite amazing. As it turns out, there is very strong evidence that Philcoxia minensis uses its sticky traps to capture and eat nematodes under the soil. Not only is Philcoxia new to science, it also offers us yet another view into the many different ways plants have evolved to obtain precious nutrients in harsh environments.